A Creative Workshop Series in Support of Artisans in Haiti. All proceeds from these workshops will directly benefit the Haitian people by funding the the artists’ program supported by Under One Sun. This funding will provide the necessary tools and education to train new artists in Haiti, making employment, and a brighter future, a reality. 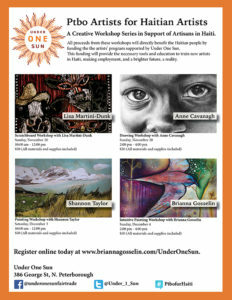 I am thrilled to be part of this workshop series and hope you will join me in the studio at Under One Sun on Sunday, December 4.